Residents got their first look at possible alternatives to track alignments and the location of a final Bridgeport Village station as part of a "Bonita to Bridgeport" open house held last week, part of the Southwest Corridor Light Rail Project. On Jan. 24, TriMet representatives unveiled those proposals to a packed house held in the community room at Tigard Public Library. Last fall, TriMet came up with a locally preferred alternative for the new rail line, a 12-mile route that begins south of the Portland Transit Mall, travels through Tigard and is expected to end in the Bridgeport Village area. Top of the Times - where might light rail end? However because of public response regarding the project's Draft Environmental Statement, the Southwest Corridor project team sought two potential adjustments to the line between Bonita Road and the Bridgeport Village area, according to TriMet officials. That was due to significant traffic issues and concerns at the location where the light rail tracks will cross Upper Boones Ferry Road. As a result, TriMet is working with a plan to elevate the tracks over Upper Boones Ferry Road as part of the locally preferred alternative (or LPA). However, those elevated tracks would result in significant more costs and impacts so TriMet is now offering the possibility of building a shorter bridge over Boones Ferry Road but via Southwest 74th Avenue. If that 74th Avenue route is selected, it would allow for the location of the Bridgeport station to the west side of 72nd Avenue, which would avoid removal of the Village Inn restaurant in Tualatin. The restaurant had been slated for demolition under the original LPA. 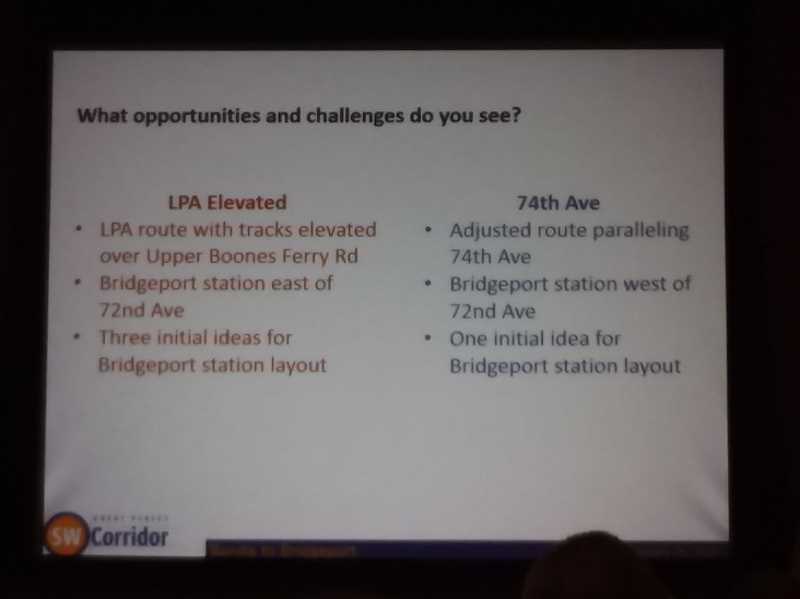 In addition, TriMet staff also provided alternative layouts for a Bridgeport station on the east side of 72nd Avenue (using the locally preferred alternative route), which would also retain the Village Inn but call for the removal of some neighboring retail or industrial flex space. Jennifer Koozer, TriMet manager of community affairs, told those at the open house that said her agency had received hundreds of comments from area residents objecting to removal of the Village Inn. The topic has caused consternation from both the restaurant's fans as well as the Tualatin City Council. Village Inn was once before displace when Bridgeport Village opened its shopping complex. 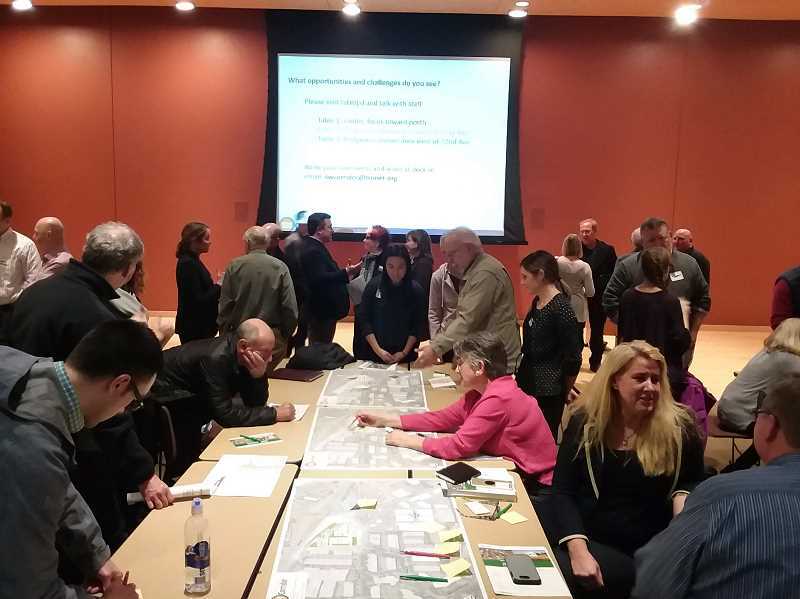 Following a presentation on those alternatives at the Jan. 24 open house in Tigard, attendees were invited to come up and list comments and suggestions as well as talk with TriMet officials about what they thought of the proposals. A future open house has been set for Thursday, Feb. 21, from 6 to 7:30 p.m., again at the Tigard Public Library. All comments and concerns residents offered at the Jan. 24 meeting (as well as online comments) will be brought back to that future meeting. In November, the Tigard City Council signed off on two measures supporting the preferred alternative alignment of the Southwest Corridor light rail. At previous meetings, a light rail station, park and ride, a Tigard Transit Center and a TriMet operations and maintenance facility have all been discussed for locations along Hall Boulevard. TriMet is projecting that 43,000 riders on an average weekday will use the Southwest Corridor route with a prediction of a 17 percent increase in general traffic congestion on I-5 between Portland and Tigard expected by 2035.